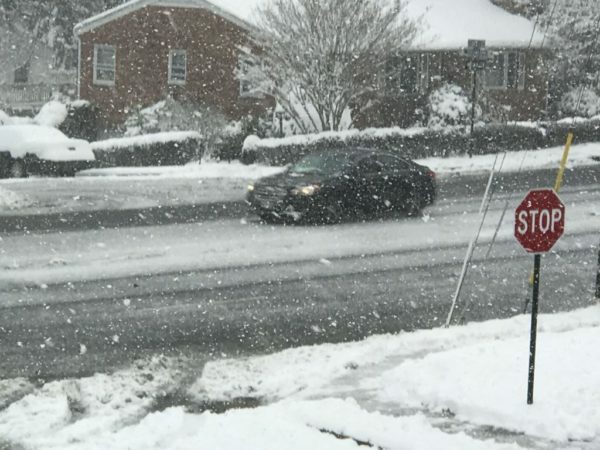 Update at 2:15 p.m. — “Please plan to leave work early today,” VDOT’s Northern Virginia office said via Twitter this afternoon. Earlier: Arlington will be under a Winter Weather Advisory tonight and early Friday as some snow threatens to disrupt the upcoming evening and morning commutes. The National Weather Service says about an inch of accumulation is expected, potentially resulting in slick roads and sidewalks. Arlington’s Dept. of Environmental Services says it is adding “extra response shifts” tonight to help keep roadways clear, though salt residue already on the roads will serve double duty as pre-treatment this time around. All Enjoy Arlington classes, 55+ classes and nature center programs with start times of 5 p.m. or later are cancelled in all buildings. Sports league activities in all community centers and other County facilities will proceed as scheduled. DPR Teen after school programs will proceed as scheduled. All Community Centers (including joint use facilities located at Drew, Carver, Gunston, Langston and Thomas Jefferson) will remain open. For information regarding the status of the Arlington Aquatic Centers, please check here.